Yes, Send Me a Swatch. Experience our cooling cover before beginning your 120-night sleep trial. Swatch samples ship free in 2-4 business days. "Highly recommended for hot sleepers! The cooling fabric on top actually works." Tired of waking up in a puddle of sweat? Our scientifically-adanced Diamond Breeze cooling cover uses a phase-change material to control your body temperature by absorbing, holding, and then releasing heat. The phase-changing material absorbs the temperature in the room, making the fabric feel remarkably cool. of harmful chemicals and dyes. Just like an athletic shirt, the cover pulls moisture away from your body to the fabric surface where it evaporates. 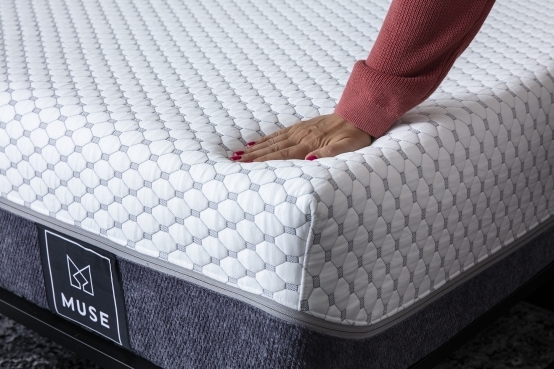 The Muse cover zips off for easy removal and washing to guarantee freshness throughout the life of your mattress. The average lifespan of a mattress is 7 years, but we cover you for 10. We've got your back because our high-density foam is designed to last.